Life got you on a short leash? So much to do, leaving so little time for you to train your dog? Don’t stress — let the Laughing Tail take care of it! We do more than just dog training: we provide relief from worry and guilt about your dog’s welfare, and prevent embarrassment caused by his behavior. 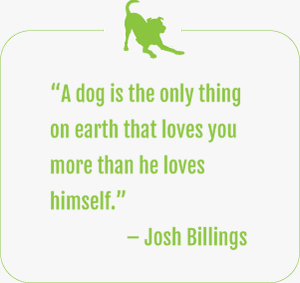 We give you the peace of mind that comes from knowing your dog is getting the training he needs to be the dog you want, and that he’s enjoying himself in the process. We come to your house and do the dog training for you, when you want us to – and you don’t even have to be home. Or you can choose to participate in the training sessions and learn how to train your dog while we work with him together! First Step:Contact us to schedule a one-hour consultation and customized training plan development session for only $95. "We contacted Laura soon after we adopted a new rescue dog. Our new little girl was timid, shy, and terrified of new experiences. Trying to take her for a walk was challenging, as she startled at every movement and noise and was fearful of other dogs and strangers. Although we are experienced dog owners, we knew we needed special help for this challenging situation. We first hired Laura for private training consultation in our home then started daycare in her home when our dog seemed ready for it. Laura's skills and confidence were so impressive and her gentle patience and use of positive training helped transform our pup from a cowering girl in the corner to a curious, playful, enthusiastic companion. We are so grateful to Laura and recommend her services without reservation." ~ Michele W.
Contact us now to learn more about our Walk n’ Train Day Training services. An intensive in-home residency training program for busy people who want fast results. Let the Laughing Tail take care of your dog in a home environment where he’s part of the family, gets personal attention – and daily training! Meet the trainers. Two certified professional dog trainers working daily with your dog. Basic obedience and good manners training, including sit, down, wait, stay, go-to-your-mat, come, and crate training. Customized training for specific behavior issues, such as challenging impulse control behaviors. Positive socialization and play with dogs of all sizes. A limited number of dogs are boarded at the same time to ensure personalized attention and training. Have peace of mind knowing your dog is being well-trained in a comfy, cozy, and completely caring home environment. At the end of your dog’s stay, we show you what he’s learned and how to make his new skills work for you. Make your reservations now for our 2019 Board 'n Train sessions available in March, June, September and December. Check out our profile on Thumbtack to see what some of our clients have to say about The Laughing Tail.